False Flame is a kinetic installation that seeks to transform the exhibition space into an undulating and entrancing interactive panorama. A rotating light sculpture with a spherical glass lens in the center serves as a projector, scanner and beacon. As it turns, it activates three textile panels arranged into a circular arc. The printed and dyed panels include translucent windows, which cast crisp images and shadows onto the walls while the space is bathed in the varying effects of colored light. Resembling proto-cinematic devices such as the cyclorama and zoetrope, this sculpture employs moving shadows and reflections to both reveal and complicate the environment it creates. The work uses repeated imagery of strip mines, resource extraction, and transportation infrastructures, and draws comparisons to both the architecture of public spaces and imagined landscapes. 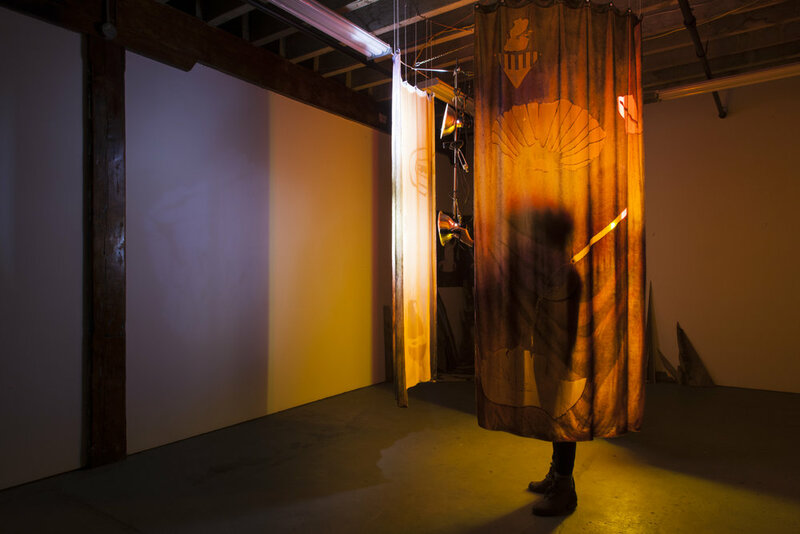 Lindsay Deifik and Nate Ricciuto’s ongoing collaboration draws on the language and imagery of both processes of data collection and the mining of wilderness spaces. These frontiers are often similarly invisible to the public eye, and this work infers parallels between the geological and physical frontiers that are merely out of sight, and the highly mediated psychological ones that spur alienation and confusion.